The first step to getting rid of a groundhog is to know you have one. 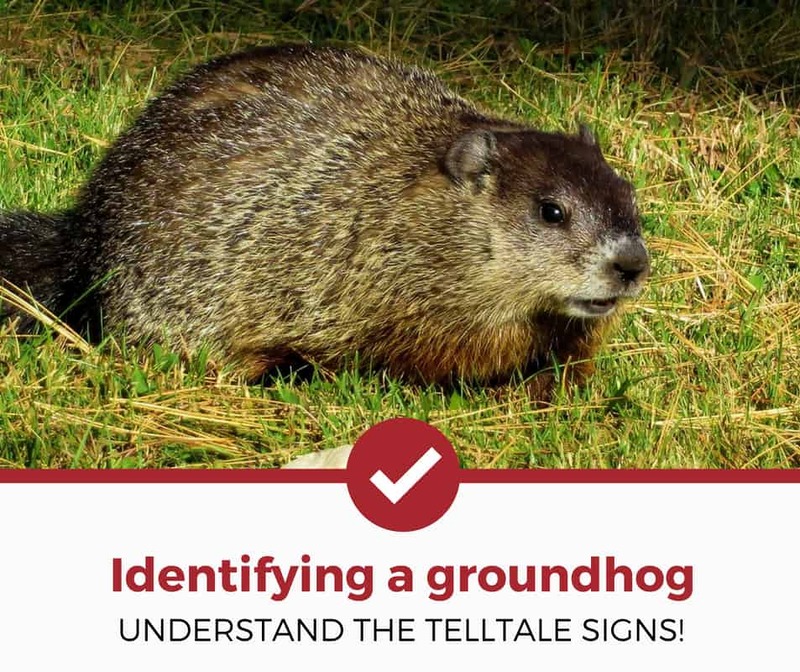 Without seeing the groundhog personally, you need to rely on your own senses by looking around the yard for the telltale signs of this animal. Some of the most obvious signs of groundhogs are tunnels, dens, and damage to plants in the garden or around the area. To discover if you have a groundhog, check out the telltale signs below. Wait...Is It The Same Animal That Sees Its Shadow? What Does A Groundhog Tunnel Look Like? What Does A Den Look Like? What Does Groundhog Damage Look Like? What To Do When You Find Signs Of A Groundhog? Groundhogs (sometimes called woodchucks) belong to the classification of marmots: animals that gorge themselves during the spring and summer and then hibernate during the winter. They look like giant, obese squirrels! Groundhogs have thick tails and rough coats of fur which range in color from brown to black. Want to skip all this research and just hire a decent exterminator for your groundhog problem? Yes, we know what you're thinking, and yes, this is the same animal as the famous Punxsutawney Phil—Pennsylvania's (and maybe the world's) most famous groundhog. Regular groundhogs, however, aren't as comfortable around humans as Punxsatawney Phil, and not nearly as neatly-groomed. Here's what you need to look for if you think you see one in your yard: they can be identified by their long, sharp front teeth and are the largest member of the squirrel family. Why Do Groundhogs Like Your Yard? The regular yards of homeowners are attractive because of the sheer amount of food available. Groundhogs have no sense of personal property so they don't think twice about eating the plants from gardens. In particular, they like fresh fruits, vegetables, and weeds like dandelions. They are primarily herbivores but sometimes eat insects when hungry. Also, if you have tall grasses where groundhogs can take shelter, they will be happy to use this area as a place to hide out from predators, as explained in the video below. Groundhog tunnels actually look a lot like those made by moles: they are several inches wide, several feet long, and totally surrounded by dirt. Some people estimate the circumference of the tunnel entrance can be between 10-12 inches around. These tunnels usually open near a garden and can be hard to see under the regular sections of the yard. Groundhogs are non-confrontational and prefer to spend as little time around humans as possible, so they create the entrances to their tunnels as covertly as possible. Some groundhog tunnels do connect while others don't. Sometimes, homeowners can find one tunnel which leads from the garden or food source and straight to the den or the main living quarters. What Does A Groundhog Den Look Like? Groundhog dens, in a word, are massive. They range in size from 8 to 66 ft. and feature multiple entrances and exits. Some sections branch off into toilet chambers while the main area serves as a sleeping spot. It's not uncommon for a groundhog to possess more than one den in case its main den gets destroyed. How Many Groundhogs Live In A Single Den? Groundhogs are not social creatures. Males live solitary lives and only encounter females during the mating season. A cute fact about these animals is that the males will go around to the local females in the area and introduce themselves before picking a female to mate with. Female woodchucks are a little different. The young stay with their mother for 2 months before they leave and make their own homes. They learn the skills they need to survive in about 4 weeks and are gradually weaned from milk onto soft foods such as dandelions. Groundhog damage is very distinctive. You'll likely see tunnel openings scattered throughout the yard and bites taken out of your garden fruits and vegetables. In addition, these animals will eat the tops of dandelions, carrots, and flowers. Other important signs of damage include sinking foundations and yard buildings like tool sheds. The animals will carve their tunnels under buildings or wherever they need to go to create the shortest path to food. They come out during the early morning and the early evening hours, and are capable of hurting other animals or even your pets. People can usually step into groundhog holes as well and might hurt themselves. It's not unheard of to accidentally step in a groundhog hole and twist your ankle or even break your leg! Once you know there is a groundhog in your yard, you can catch it to release it later or eliminate it yourself. You have a few options available: call a pest control company, use a trap, or gas the groundhog tunnels to kill any of the animals in the area. For inexperienced people, calling a professional is probably your best bet. If you want to trap or gas the groundhog, you need to check the local laws in your area because some states make it illegal to trap or kill large animals like woodchucks and raccoons. The decision to trap or gas comes down to whether or not you are willing to kill the groundhog. Most traps cost upwards of $50 and look like metal cages which can be opened and closed by a spring-loaded door. These traps have handles so that the user can bring the trapped animal to a wildlife reserve for release. Gas bombs are less expensive but more difficult to use. They are relatively inexpensive when compared to the cost of a trap, and need to be lowered into an active groundhog tunnel. They work by releasing a toxic gas and will kill any animals in the tunnels. Once you know you have a groundhog, you can identify where it lives and then make a decision about how to handle the situation. If you are uncomfortable with trapping or gassing make sure to call a professional, who can work with you further to give you some options. Curious about other groundhog related products? Check out our other detailed guides to help you deal with your pest problems.